This spectacular gift set for the newborn baby girl is a beautiful creation to celebrate her debut into the world! She will surely enjoy her deluxe mini wagon to pull her toys around. Made of wood and generously sized at 2 feet long and 10 inches wide, it is well built and very sturdy for years of playtime activity! 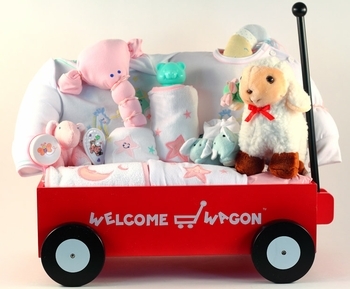 The welcome wagon comes brimming with lot of necessary baby girl layette items and a large assortment of useful accessories that every new mother will certainly need and appreciate. Free shipping and gift wrapping is also included! The entire collection is carefully wrapped in sheer tulle fabric for an elegant presentation. Please click on More Images above to see the gift wrapping. A really great baby girl gift! This gift is awesome! I had no idea that all the stuff you put in is such good quality. I was expecting everything to be just okay because it's a gift basket but the quality is obvious once you see and feel the outfits and things. I'm very impressed with every item including the wagon, even that looks well built! Thank you! This welcome wagon was a bit hit! This wagon was much bigger and sturdier than expected. Each of the gifts inside the wagon were high-quality items and very well put-together. I will buy this product again!